The Trinidad All-Colleges Football team had their first victory in their three-match series in Jamaica last night when they edged Kingston College 3-2 in their return match at the National Stadium. This was the final match of the tour. At half time the K.C. boys led 1-0 with an early goal from centreforward Trevor Harris. 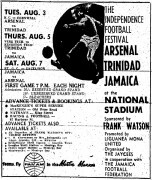 Early in the second centreforward Kenny Josephs gave the Trinidadians the equalizer. K.C. soon went ahead again when an Oxford movement ended with Harris scoring his second. Outside left Ellis Sadaphal soon got the equalizer from a melee. Inside right Everald Cummings scored the deciding goal one minute before the end. A part of the Trinidad squad are scheduled to leave this afternoon, the rest will leave on Tuesday.